Liverpool left-back Andrew Robertson has spoken about Jurgen Klopp’s reaction to the team’s dropped points against West Ham on Monday night. The Reds missed an opportunity to go five points clear of title rivals Manchester City at the top of the table, putting in an unconvincing display as they drew 1-1 with West Ham. Liverpool will surely need to improve, and Jurgen Klopp can’t have been impressed with how nervy his side looked throughout, particularly defensively. 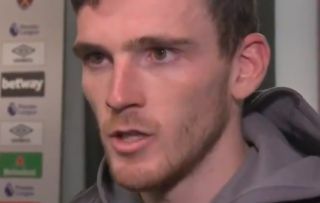 Robertson admitted the Hammers caused them problems on set pieces and that they could have done better on their goal, though he admitted Klopp did not say a great deal in the dressing room afterwards, preferring to take more time to reflect on things.